Epson EH-TW7200 review | What Hi-Fi? Epson projectors have been on fine form in recent years, and the new Epson EH-TW7200 easily takes its place among its five-star stable. 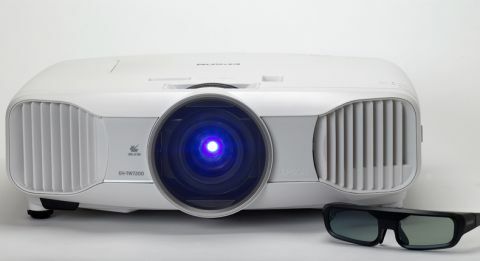 We’re expecting a great-looking picture for £1900, and the Full HD LCD TW7200 projector doesn’t disappoint. It’s a wonderfully natural picture, but with enough ‘pop’ in colours to keep your attention. Colours have depth and richness, and plenty of subtlety – it’s captivating. Detail is crisp and precisely drawn, without being unnaturally etched. The texture of rough wood, soft cloth, and billowing smoke from a stream train in The Book Thief Blu-ray all look tangible and realistic. Skin tones have subtle shading, and the fleshy tones are realistic. We like how bright and punchy the Epson picture is, while also managing to balance a natural tone. The whites in Star Trek Into Darkness are bright, while blacks are deep and inky. Dark scenes don’t swallow up finer detail either, as there’s lots of it in the shadows. These picture characteristics remain on DVDs, too. Of course, there’s the expected drop in subtlety and a softening around the edges, but the TW7200 remains surprisingly well defined and retains its nicely judged colour tone when upscaling Who Framed Roger Rabbit. It doesn’t succumb too easily to picture noise, either, so it's worth wiping the dust off your DVD collection and giving them a spin. Motion is stable and relatively smooth, even with 3D films. The slow, panning shots in Gravity are handled confidently, and the Epson doesn’t falter even when the action gets lively. There’s depth and drama to the 3D picture, too and the picture remains bright and punchy, even after the expected dimming. Epson helpfully includes a pair of active shutter glasses in the box and they’re light and comfortable to wear (extra pairs cost around £70 each). We always use a THX Optimizer disc when setting up the picture, but there was very little (if any) tweaking needed for the TW7200 – just make sure the ‘Brilliant Colour’ option is turned off for a more natural tone. This is a big, hefty projector. A smooth, curved design and the all-white finish means it looks stately and elegant, though, and build quality is impeccable. We like how the controls are hidden on the side of the TW7200, leaving the main body uncluttered. We’re also big fans of the manual lens shift – vertical and horizontal. Picture set-up is quicker and easier as a result, and you can be more flexible with where you place the projector. Manual zoom and focus are included as well. The remote is similarly large and chunky, but never feels cumbersome. Layout is logical, and there are useful one-button shortcuts for inputs and picture adjustments. It’s responsive, too, and an amber backlight helps control in a dark cinema room. The TW7200’s back panel is surprisingly neat and tidy: two HDMI inputs, and inputs for composite, component and PC; that’s it. We like the simplicity, although some may want more options. Overall, there’s very little to fault on the Epson EH-TW7200. It’s an effortless performer. We love how easy it is to set up, and the gorgeous picture quality will have you wanting to watch all of your favourite films again and again. If you’re looking to upgrade your home cinema or want to start off in style, the EH-TW7200 should be on top of your shopping list.